XBMC Media Center has always been a favorite application of mine, because of its extensive customizability and versatility, being ported to many different platforms. I am pushing some proof-of-concept code today for something I’ve been working on over the past few days to add one more to the mix – support for the wayland compositor infrastructure. There is a bug somewhere, I suspect this one, which is causing xbmc to hang and stop receiving any events from the server as soon as it starts a new thread going into, eg, the “Videos”, “Music” or “Settings” menu. Understandably, this makes xbmc less useful than it would otherwise be, but I am releasing the code now in case anybody is interested in digging into this one. Scott Moreau for bringing that backend up to the 1.0 API and figuring out why the event queue dispatch didn’t work, and also providing the inspiration to do this by creating a wayland backend for dolphin-gcemu. I really hope Wayland gets adopted quickly by applications and graphics libraries. This is an interesting POC, however it’s not really in fitting with how we had planned to handle wayland. I recently rewrote our egl handling so that we can dynamically support various windowsystems on the fly, so that we can have a single binary capable of running X11/wayland/framebuffer. It was explicitly written with wayland in mind. 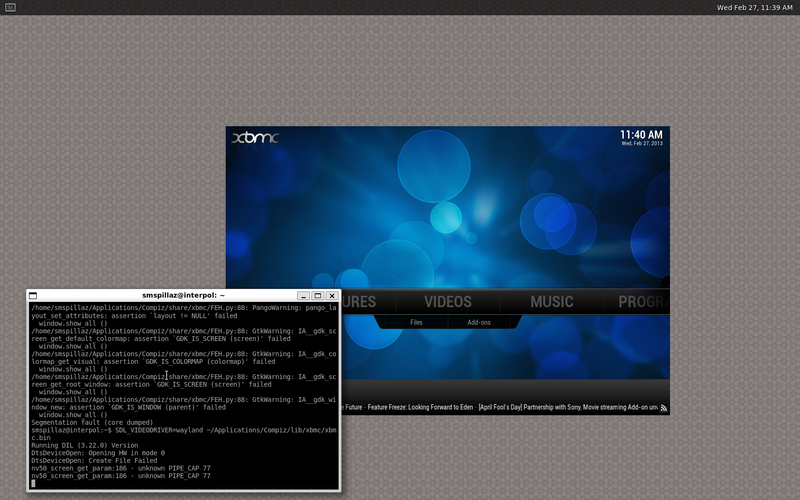 See https://github.com/xbmc/xbmc/commit/2b49c791eb236ae4fe2be90ac7e7b8ccf0aad72f for the pull, and https://github.com/xbmc/xbmc/blob/master/xbmc/windowing/egl/EGLNativeType.h for the interface. It’s very pluggable, and I suspect it’d be far less work than what you’ve done here. I was hoping to get to it ages ago, it just hasn’t been a priority yet. Feel free to ping me (theuni on github or freenode) to discuss if you’d like. I have a functional X11 POC backend around somewhere that you could use as a reference for porting. Hey Cory, thanks for the reply. I agree with you completely, a native backend would be far nicer. The upside was that I was able to fix up SDL a little bit. I’ll ping you on GH (I can’t be on IRC at the moment). that metabolize your calories to fuel your bodily functions, after all. Bartfield says to eat breakfast every day within an hour of getting out of bed. It’s not the animal that matters, it’s where the meat comes from on that animal. from the Center for Disease Control shows that over 60 percent of Americans are classified as overweight or obese. Thanks for writing such an easdsto-unyer-tand article on this topic.